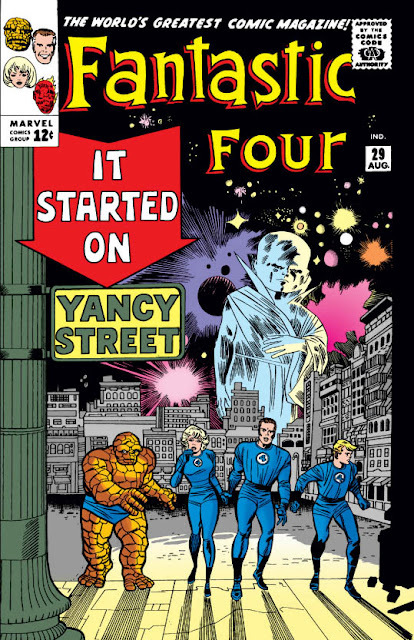 You may argue with me if you'd like, but I propose that Fantastic Four #29, "It Started on Yancy Street! ", boasts one of the most striking, most compelling covers of the Silver Age. Just look at it: Our fantastic foursome crossing an empty cityscape (Johnny, tensed, looking off to his left at ... something), their shadows long and lean and reaching toward the reader, with the ghostly figure of the enigmatic Watcher towering over the nighttime sky, filled with far-off planets and space clouds and starbursts. It's a cover that tells remarkably little about what's inside, but does so by conveying a real sense of mystery and foreboding. Fleeing isn't the reaction we normally expect from our intrepid adventurers! With such a great cover, then, as well as its equally intriguing title, it's a shame that the story inside is such a disappointment. The villain of the piece turns out to be the Red Ghost and his Super-Apes - and how implausible is it that our heroes don't immediately know who their foe is as soon as they're attacked by three super-powered apes they've fought once before? Bereft of any new motivation for the character, Stan Lee falls back on his oft-used trope of "wanting revenge solely for being beaten before"; never an interesting reason, even at the best of times. 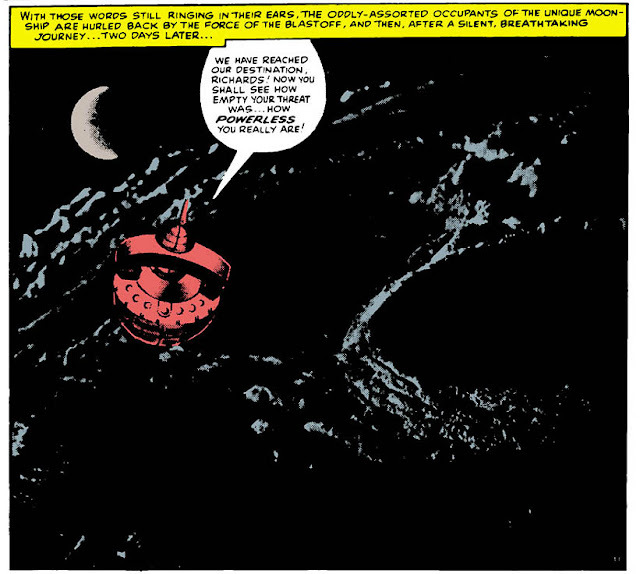 In fact, in every way the tale seems a rehash of their first appearance in issue #13, right down to the return to Earth's moon and the resolution being facilitated in part by the Watcher (who's still not interfering at all, honest you guys, seriously). successful, but surely prefigures further innovation to come. The funny thing is that the idea inside is executed well - it's just not very original. (Which thus prompts reflection: Is this, then, better or worse than a good idea done bland?) Kirby's art is in top-form - including one of his rare, at this point in time, photo-collage efforts - and the Red Ghost's scheme to capture the FF and take them to the site of his prior lunar defeat is impressively planned, on a level of that which we'd expect from the Mad Thinker. I'm tempted to say "Imagine if this kind of creativity had been applied to an idea that was fresh, new and exciting!" - but on further reflection, I don't have to; we have most of the other issues of Lee and Kirby's FF to deliver on that. Does anyone else think that last panel was Stan playfully commenting on the art? Still, despite the story's flaws (which also include a meandering pace whereby the action doesn't really begin until page 6), there are nevertheless a number of great moments to be seen within. The story does, as promised, open on Yancy Street, and the sight of the Four running away from a bunch of hidden pranksters is richly funny. When they return to the Baxter Building, The Thing and his girlfriend Alicia get a short scene in which each of them starts to break up with the other - convinced they're only being dated out of pity - before they realize they're both being sweetly dumb. And the climax of the story takes place within the Watcher's home on the moon, where the design and household accoutrements really do convey a sense of wonder and alien-ness that's only fitting for a being so removed. I love Marvel's occasional pop-psychedelia. Very "sixties", and very cool!